This post is part of an on-going blog series called, “Our Speech-Generating Devices: Up Close and Personal.” Each week we’re highlighting a new feature on our devices. Check out last week’s post here. In Part 3 of our 5-part series, “Our Speech Generating Devices: Up Close and Personal,” we are discussing the new device speed. If you are interested in learning more about his feature, please call our Clinical Consultant team at 888-274-2742. If you have been keeping with our blog series, you probably noticed that we’re talking a lot about our SGD’s increased customization. The benefits of this upgrade are tremendous for the user. Not only is it easier for users to express their personalities, but it’s also faster to communicate with the device. The changes can be seen on the Navigation panel in the device’s settings. Now, our team, a clinician, or a caregiver can change the settings of the device to: slow, fast, or custom. 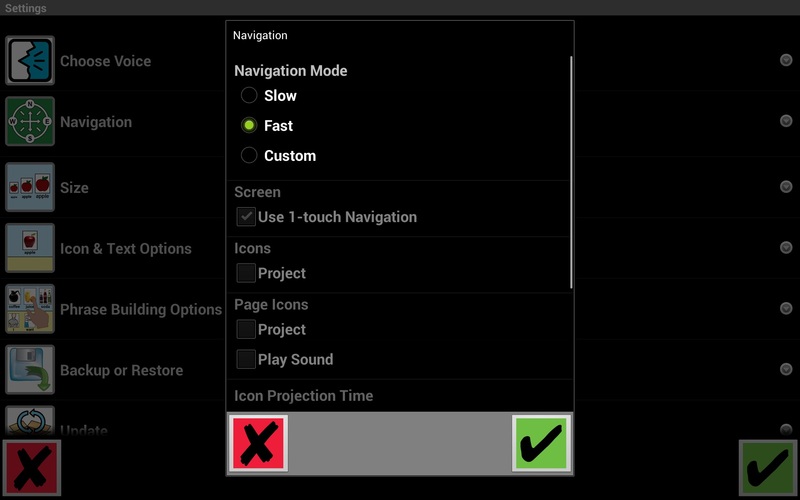 One-touch navigation can also be turned on and off. Icons can project or not project. Projection time can also be adjusted to one or two seconds. Finally, the phrase playback speed is now slow, normal, or fast. See the new Navigation panel below! Now, the speed of the machine matches the needs and language abilities of the user. If a user’s skill level allows them to, they can program the device to move faster in order to make communication more accessible. If you are interested in seeing the TouchTalk or MiniTalk device, please call our team at 888-274-2742. As always, we are pleased to send you a device to try for free.